* The worship ceremony for deities of Krishna is called arati in Sanskrit. Depending on time of day, these aratis have different names. Mangala means "auspicious" and is the name of the early morning worship ceremony. Sandhya, or "twilight," is the name of the evening arati. Puja means worship, bhajan devotional songs, and kirtan is group call-and-response chanting of sacred hymns, mantras, accompanied by traditional musical instruments. 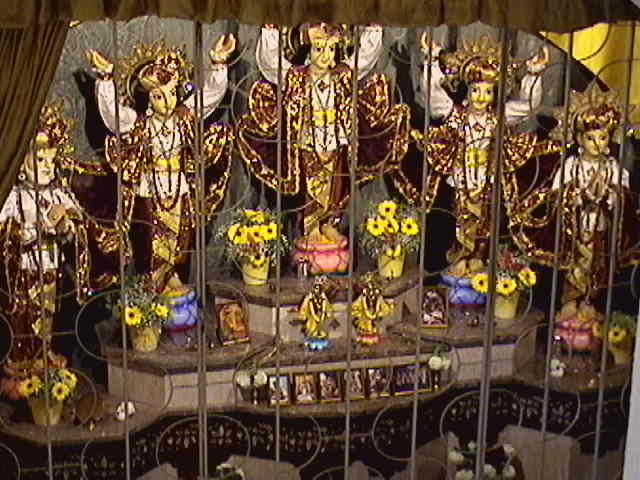 Morning and evening, devotees hold classes on sacred texts such as the Srimad-Bhagavatam and Bhagavad-gita. Submitted by Jagat-Prasu on Sun, 2015-12-27 18:39.